As winter storms transition to spring rains, underwater visibility usually increases and research field season kicks into high gear. 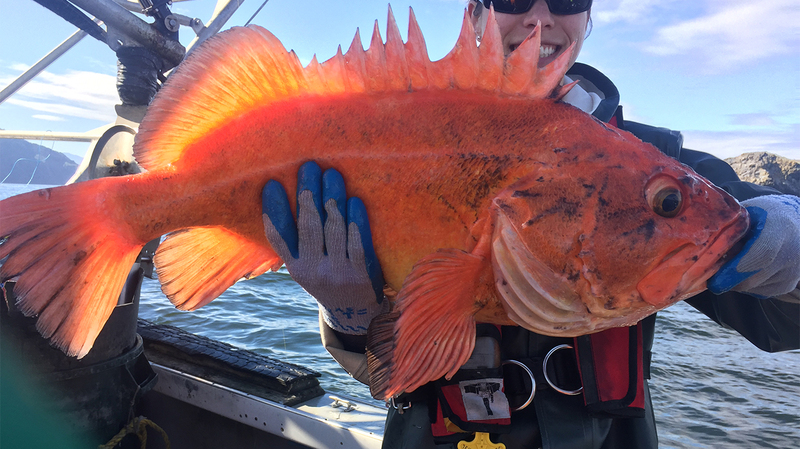 The ecological research team conducts multiple studies at Oregon’s 5 marine reserves and 8 comparison areas along the Oregon coast – and 2019 is already jam packed. This year, hook and line surveys will be at Cape Falcon and Redfish Rocks. Last year, the team sampled a combined total of over 2,000 fish during our surveys at Cascade Head and Cape Perpetua (read our FishOn! newsletter to learn more). Like last year, 2019 will also include oceanography data collection, with sensors going out at Otter Rock, and Redfish Rocks in April and May. This year will be our first year gathering oceanographic data from Cape Falcon and its comparison area, with sensor deployment scheduled for this spring. Our oceanographic efforts will compliment ongoing data collection led by Oregon State University at Cape Perpetua. Underwater video surveys are slated for Otter Rock and Redfish Rocks in the spring and fall. Remotely Operated Vehicle (ROV) surveys will be done at Redfish Rocks in the spring. Video lander surveys will be done in the spring and fall at Otter Rock and Redfish Rocks Marine Reserves. SCUBA surveys will occur at Redfish Rocks and Otter Rock this year. The team will work with academic collaborators to conduct intertidal biodiversity surveys and sea star/mussel surveys at the Otter Rock and Cascade Head. 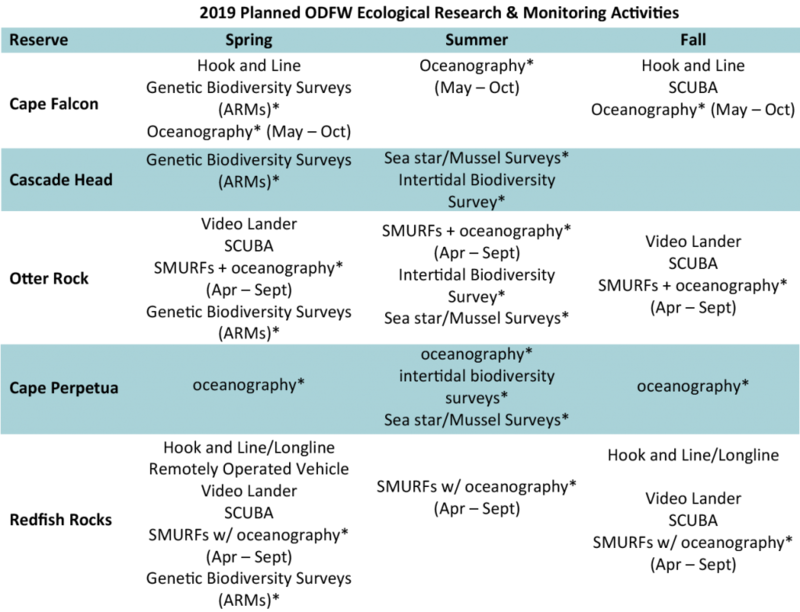 These surveys will be led by collaborators at the Cape Perpetua Marine Reserve. Our collaborative juvenile fish research, called SMURFs, is scheduled for another year at Otter Rock and Redfish Rocks. Lastly, there is a new survey tool being piloted – autonomous reef monitoring structures, also known as ARMs. These act as a sort of ‘invertebrate hotel’ and are made of a series of stacked plates that organisms will settle on over long periods of time. Researchers use the ARMS to study genetic biodiversity, which combines the study of species biodiversity of small encrusting and mobile organisms with molecular methods. ARMs will be placed deep beneath the surface of Cape Falcon, Cascade Head, Otter Rock and Redfish Rocks Marine Reserves and their associated comparison areas. Below is a planned research schedule for 2019. ODFW marine reserves staff lead and carry out several ‘core’ surveys including: hook and line, SCUBA surveys, and video surveys (i.e. lander drop video surveys, and the ROV surveys). Through academic partnerships we are able to expand the research and monitoring done at the reserves. Collaborative studies include: SMURFs, intertidal surveys, ARMS and oceanography research.